Specification : Size : 22/20 125/75 ---- Thickness : approx. 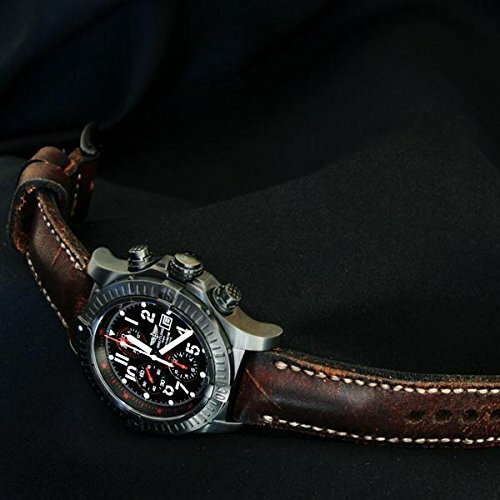 6mm on padded area, thin down to 4mm ---- Style :Brutal, strong looks, but elegant, vintage of course ---- This item includes watch straps and buckle (optional). The watch is for reference only. ---- We also make custom watch straps if you want to request any change to the straps. ---- --------------------- About Gunny Straps : Gunny Straps is founded by Peter Gunny on 2008, and has been producing thousands of custom straps ever since. All straps are fully hand made with help of small manual tools making every strap is unique and have their own character. In the early time, Gunny Straps is known for the handmade vintage creation, especially for big watches, such as: Panerai, Bell & Ross, U-Boat, and many others. But, we don't stop innovating! Now, we can make almost for any kind of watches, from: SevenFriday, Rolex, IWC, Tudor, Breitling, Omega, Tudor, JLC, Tag Heuer, Seiko, Cartier, Hamilton, and even Audemars Piguet which takes years of research to build the metal insert to be perfectly installed on each of our straps. In addition, we also invent unique croco straps that is fully customizable into unlimited color and unbelievably rich color effect that you can't find anywhere. Those who know Gunny Straps since the very first journey, must know that Peter Gunny takes challenges as the greatest motivation. One of the precious memory is making straps for Arnold Schwarzenegger and Sylvester Stallone as the order from a really good friend, Julio Grey. There are so many reviews on the watches forum about Gunny Straps that you can search for, and sure, they are honest opinion from our satisfied customer friends. If you have any questions about this product by Gunny Store, contact us by completing and submitting the form below. If you are looking for a specif part number, please include it with your message. Sivalya Wildflower Moonstone Necklace and Earrings Set in 925 Sterling Silver with Black Rhodium Plated, Openable Frames – wear with or without the stone, Great Gift for Her!